The critical geopolitics literature has engaged popular culture and media in many forms, usually focused on mass media or elite-produced niche media. The issue of humor as a form of popular culture with geopolitical content has been explored only recently by geographers. 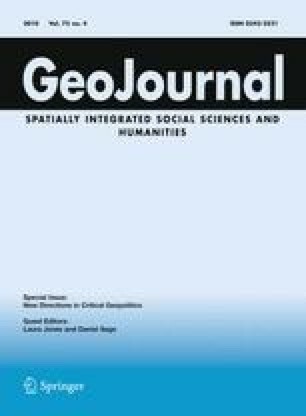 This paper utilizes disposition theory, with its emphasis on social context, to link humor and geopolitical analyses of humor. The analysis of two Jeff Dunham comedy skits centering on the character Achmed the Dead Terrorist demonstrates the utility of disposition theory as a construct to situate humor in the context of its original production and as a fluid, global phenomenon that is shared through various social networks via the Internet. This article is in memory of Mahmut Gokmen, who passed away July 20th, 2008. The authors thank the three anonymous reviewers for their helpful guidance and the forbearance of the guest editors in light of the tragedy. Miller, J. R. (2008). Comedian defends ‘Achmed the Dead Terrorist’ Puppet routine against South African Ban. Fox News http://www.foxnews.come/printer_friendly_story/0,3566,431866,00.html. National Annenberg Election Survey. (2004). Daily show viewers knowledgeable about presidential campaign, National Annenberg election survey shows. September 21. http://web.archive.org/web/20050308165738/http://www.annenbergpublicpolicycenter.org/naes/2004_03_late-night-knowledge-2_9-21_pr.pdf. Accessed November 6, 2008. Smuts, A. (2006). Humor. The internet encyclopedia of philosophy. Retrieved December 12, 2007, from http://www.iep.utm.edu/h/humor.htm. Tsai, M. (2007). Honey, I’m Dead! : How god rewards a female suicide bomber. www.slate.com. Accessed November 5, 2008. Dunham, J. (n.d.) 2008 Achmed the dead terrorist. Accessed April 1, 2008. http://www.youtube.com/watch?v=vgRPc7d9GPoandfeature=related. Dunham, J. (n.d.) 2008 Jingle bombs. Accessed April 1, 2008. http://www.youtube.com/watch?v=S7B-cHSy8F0. All Comments. Achmed the Dead Terrorist. (2008). Accessed October 20, 2008. http://www.youtube.com/comment_servlet?all_commentsandv=1uwOL4rB-goandfromurl=/watch%3Fv%3D1uwOL4rB-go.